After installing Fedora and running Yum to install all of my required updates, I rebooted my computer into the updated kernel. However, when I boot into this kernel my Logitech mouse and keyboard, both connected via a Logitech Unifying Receiver, do not work. I know it is the kernel because if I boot up using the old kernel my mouse and keyboard work as they did before the update and on Windows before installing Fedora. Is there something I can do to fix this so that my keyboard and mouse are not useless and I don't have to stick with an outdated version of the kernel? Looks like this is another system affected by this bug. Try rebooting with an earlier kernel by choosing an earlier entry in your grub boot screen. Thank you for your response. Rebooting to an earlier version of the kernel works but will this bug be fixed? I don't want to be stuck using an outdated version of the kernel. Keep an eye on the bug report I posted, I'm sure as soon as its fixed, Fedora will pick up the change. I packed Solaar, maybe fix the problem. 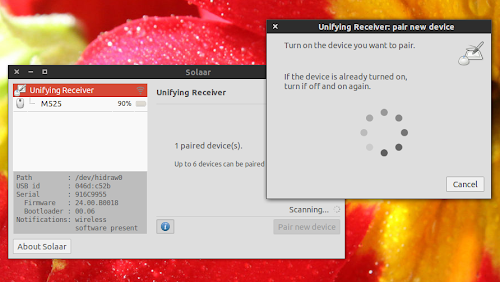 Solaar is a Linux device manager for Logitech’s Unifying Receiver peripherals. It is able to pair/unpair devices to the receiver, and for most devices read battery status. Solaar will detect all devices paired with your Unifying Receiver, and at the very least display some basic information about them. For some devices, extra settings (usually not available through the standard Linux system configuration) are supported. For a full list of supported devices and their features, see devices. Solaar did work for me too. And thankfully Solaar is now part of fedora's main repository so no need to use sourceforge.